This week, Louis Shackshaft has taken a look back at former Sheffield Wednesday winger Chris Waddle. Born in Felling, County Durham, Waddle went on to earn 62 caps for England, finding the net on six occasions. Waddle was renowned for his outstanding dribbling skills and with the ability to skip past a defender at any given moment, he was a manager’s dream in the attacking third. The 6ft 2 inch playmaker had a career span over 24 years from 1978 to 2002. Waddle made his name at Newcastle United after contributing with an outstanding 46 league goals in 170 appearances after signing for The Magpies as a 19-year-old in the summer of 1980. Having made such a huge impact in the North East, Waddle was attracting some serious attention from clubs across the country. Tottenham Hotspur signed Waddle five years later in July 1985 for £590,000. An impressive debut saw the charismatic winger net twice on his home debut against Watford. After netting 33 times for Spurs in 138 league games over a four-year period, Waddle had a culture change when he signed for French giants Marseille in 1989. This move saw Marseille fork out £4.5m for the England international, upon which, at the time was the third highest ever transfer fee paid for a player. Waddle had become one of the most notable players in the world and he did himself no harm by winning the French Ligue 1 title on three occasions. However, Waddle unfortunately missed out on a European Cup honour after defeat in the final to Red Star Belgrade in 1991. Trevor Francis signed Waddle for Sheffield Wednesday for a fee of £1m in July 1992, therefore, making his return to the UK. The Owls new recruit helped guide Wednesday to both the FA and League Cup finals in the 1992-93 campaign. Despite losing on both occasions to Arsenal, Waddle was awarded as the Football Writers’ Association Footballer of the Year for 1993 – an outstanding achievement. Although Waddle continued to attract attention from various clubs, he remained at Wednesday for four years in total and has since gone down in S6 folklore as one of the best players to ever grace the Hillsborough turf. 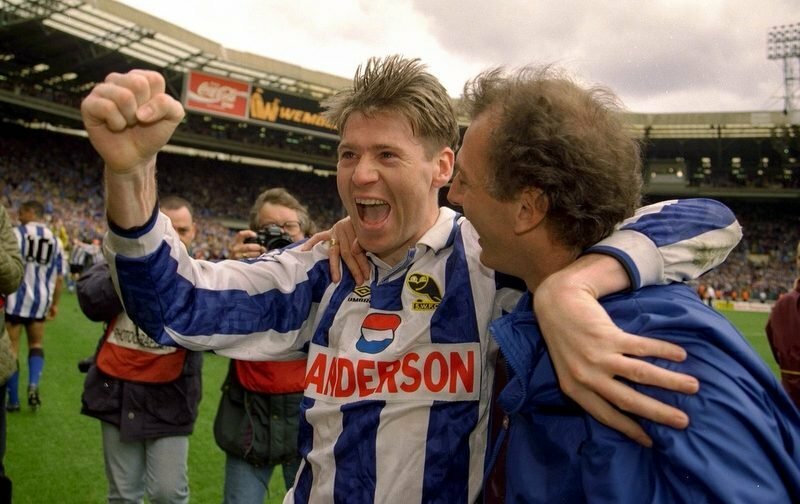 Wearing the blue and whites stripes of Sheffield Wednesday, Chris Waddle made 109 league appearances in total for The Owls, scoring ten goals combined with a hatful of assists. Waddle’s Wednesday career came to a halt shortly into the 1996-97 season due to reoccurring injuries. Upon his release, The Owls legend extraordinarily went onto play for another nine teams in total, including Falkirk, Bradford City and Sunderland to name a few. At 42, a ripe old age for a footballer, he also made appearances for Worksop Town, Glapwell and Stocksbridge Park Steelers. Furthermore, he played once for Hallam FC in 2013 at 53 years of age. Obviously, Waddle’s love for the game was still shining through. As well as a glittering club career, Waddle was also a first-team regular in the England set-up and reached the quarter-finals of the World Cup in 1986 and the semi-finals in 1990. England have failed to reach such a stage ever since. Everyone associated with Sheffield Wednesday, plus the other 13 clubs he played for in total, would like to thank Chris for the fond memories he gave us predominantly in the 1980’s and 90’s. Those memories will live with us forever.